You’re inviting someone for dinner and you want to impress them… too bad you don’t really feel like putting too much time, effort or money to cook something too fancy. Fortunately for you (and for your guest!) Italian cuisine can be very easy to cook, tasty and healthy! 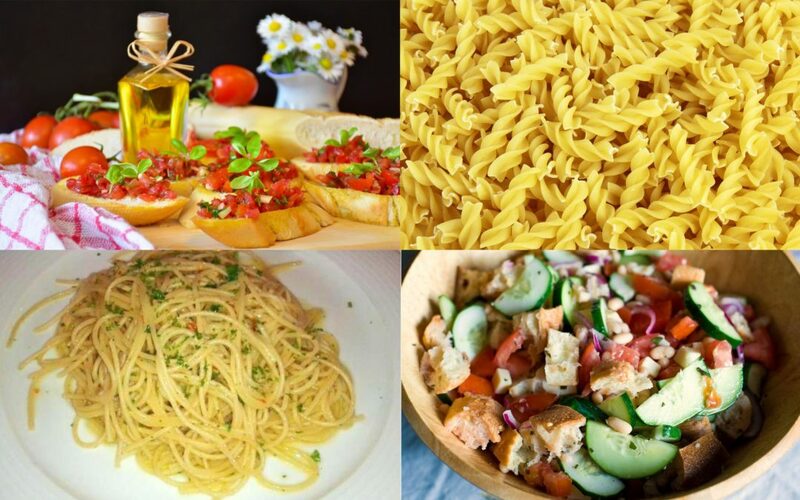 Here’s a top 5 Italian recipes which are both delicious and super-easy to cook. STEP 1: Strain the peeled tomatoes and then put them in a bowl. Proceed squashing them into irregular pieces with a fork.STEP 2: Put a pot full of water on your stove, drop as much salt as you like in the water (ideally, a fistful of salt is enough). In the meantime, oil generously a frying pan and stir-fry the peeled garlic clove. STEP 3: add the small chili peppers to the stir-frying garlic clove. Let the mixture gently stir fry, then add the squashed tomato pulp. STEP 4: stir the sauce and add as much salt as needed. If the tomato sauce is too sour you can add a little bit of sugar to adjust its acidity. After having adjusted salt and sugar, cover your frying pan with its lid and let the sauce cook up for roughly 10 minutes. Remember to stir the sauce every once in a while and remove the garlic clove after the sauce is ready. STEP 5: when the sauce is ready, drop the pasta in the boiling water. As soon as the pasta is ready, strain it, put it in the frying pan where you cooked the sauce and add the chopped parsley. STEP 6: Sauté the pasta in the frying pan, stir it and serve hot. Did you know? Pasta all’arrabbiata literally means angry-style pasta. STEP 1: Peel the onions, chop them in half and then into very thin slices. Grab a bowl and open the eggs in it. STEP 2: Add the Grated Parmigiano and as much salt and pepper as needed to the eggs. Use a fork to beat the eggs into a homogenous cream. STEP 3: oil a frying pan up with the 3 spoons of extra virgin olive oil, then pour the onions and let them stir fry for 4 minutes. After that, lower the heat of your stove and add as much salt as needed. When the onions will be nice and soft you will have to proceed to add the egg. STEP 4: Add the battered eggs to the stir-fried onions. Be careful not to leave any piece of onion out of the battered egg. Cover the frying pan with its lid and proceed to flip the frittata over as soon as it looks compact enough. STEP 5: in order to flip the frittata you just need to remove the lid from the frying pan. Cover the top of the frying pan with a dish, flip the frittata over, and then let it slide again in the frying pan. Watch your hands! We don’t want you to get burned. Enjoy your frittata alle cipolle! You’ll be asking for seconds! STEP 1: Grill a slice of bread. Ideally, each slice should be 2 cm thick. If you don’t happen to have a grill or a toaster, a frying pan will do the trick. Just make sure to grill both sides of the slice. STEP 2: When you’re done grilling the bread, rub the garlic clove on it. A garlic clove should be more than enough for 4-5 slices of grilled bread. STEP 3: Chop down the cherry tomatoes add oil, salt and two pinches of oregano. Mix everything. STEP 4: Gently pour the diced tomatoes on top of the grilled bread. Enjoy the summery vibes of an authentic Italian-style bruschetta! STEP 1: Pour the spaghetti into boiling, salted water (ideally a fistful of salt is enough). STEP 2: Peel the garlic clover and chop it into small pieces. Chop the chili peppers as well. You might want to add extra chili peppers or use less than recommended according to your taste or tolerance to spicy food. STEP 3: Pour all the oil into the frying pan. Set the stove temperature to medium-low and let the oil heat up. Gently pour the chopped garlic and the chili peppers as well. Be careful not to burn the garlic, or the dish will taste terribly! Just let them stir fry for a couple of minutes. STEP 4: Strain the spaghetti as soon as they’re aldente, i.e. firm to the bite. Generally speaking, the spaghettis are aldente as soon as the white of the pasta center disappears. Pour the strained spaghetti into the frying pan where the mixture of garlic, oil and chili peppers is. STEP 5: Stir and serve hot! If you feel like it, you can also add some chopped parsley. Do you know what could go with those spaghetti aglio olio e peperoncino? An ice-cold Peroni. And maybe some football on TV. Did you know? Italian youngsters enjoy this meal as a midnight snack after a drinking night out. The reason? Spaghetti aglio olio e peperoncino are dirt-cheap, easy to cook, savoury and will fill you up! STEP 1: Peel and slice the onion into thin slices, then put it in a bowl with water and a spoon of white wine vinegar. Let it sit for 2 hours. STEP 2: Peel the cucumber (you might want to use a potato peeler) and then slice it into thin slices. Chop down the tomatoes as well. STEP 3: Wet the bread with a mixture of water and a spoon of white vinegar. As soon as the bread softened, gently squeeze the water out of the bread and let it crumble in a big bowl. STEP 4: Strain the sliced onion and put it into the big bowl with the crumbled bread, the chopped tomatoes and the sliced cucumber. Add oil, salt, pepper and the basil leaves that you can break into smaller pieces directly with your hand. If you feel like it, feel free to add an extra spoon of white wine vinegar. Let it sit in the fridge for some time and serve fresh. That’s an excellent option for picnics or summer parties! Did you know? Panzanella is a poor dish which was invented to reuse old, dry bread. Today Italian people enjoy this dish during summer time because it is very fresh and it requires no cooking for its preparation. The maximum result with the minimum effort: that’s how we like it! Feel free to brag about your results with your guests and let us know how your meal went by writing your experience here in the comment section.